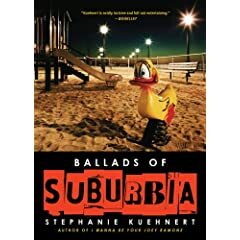 I haven't heard of the first book, however, I am excited to read Ballads of Suburbia. I know that Khy, from Frenetic Reader, said that it made her cry. I'm really looking forward to seeing if it has a similar effect on me. Hey Jessica- I hear ya on the deadlines!! Good luck with yours! Hey Taste LIfe, Melanie, and kensbrown-- I know, doesn't it sound great?! That's so funny because I was just looking at Greg's book: Alibi Junior High because we're featuring it on Free Book Friday Teens in a few weeks and I thought, "wow, this book sounds REALLY good!" I might have to take a look! But alas, it will have to wait until after my (VERY) looming deadline on August 15. Damn deadlines! Jessica- Ditto on the deadlines!